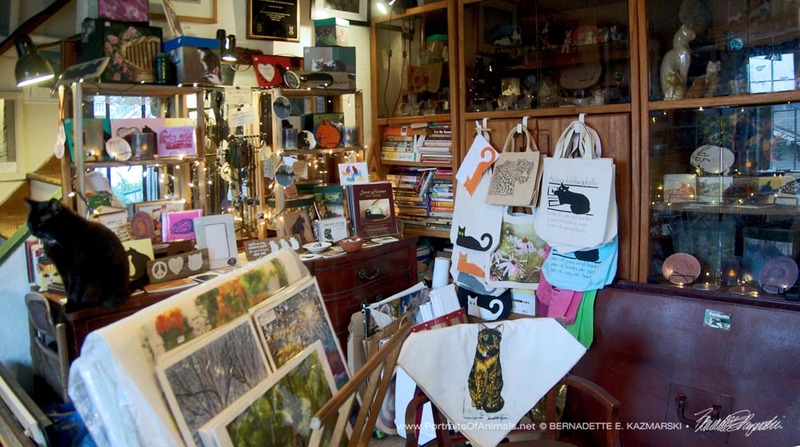 This gallery displays all of my trinket and decorative dishes. Each one is handmade and handpainted, and unique. The distinction between “trinket” and “decorative” is based roughly on size but is very subjective. 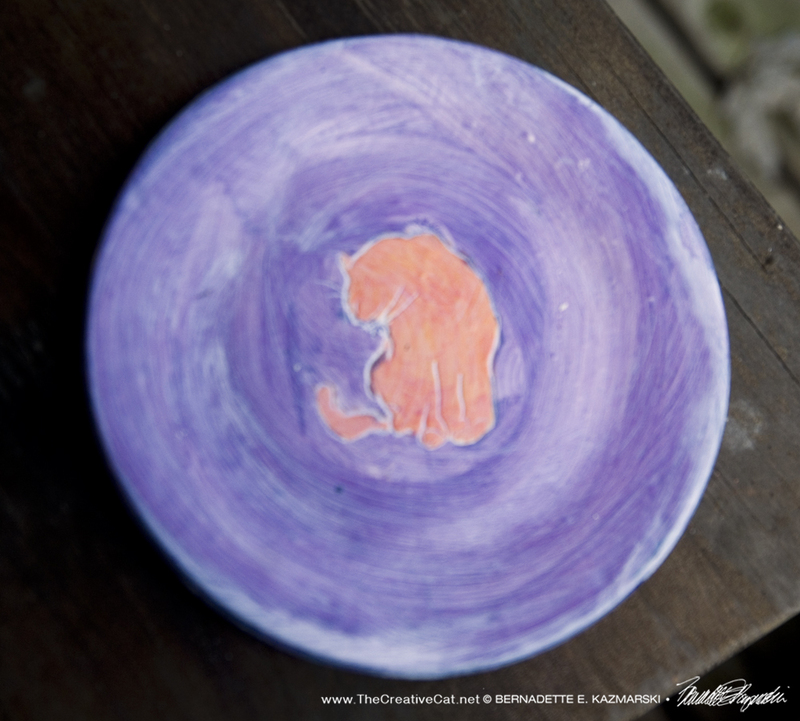 My initial trinket dish, “Curving Silhouette” was 3″ in diameter, much like other little dishes or shallow bowls used for decoration or to drop small items into such as jewelry for safekeeping. 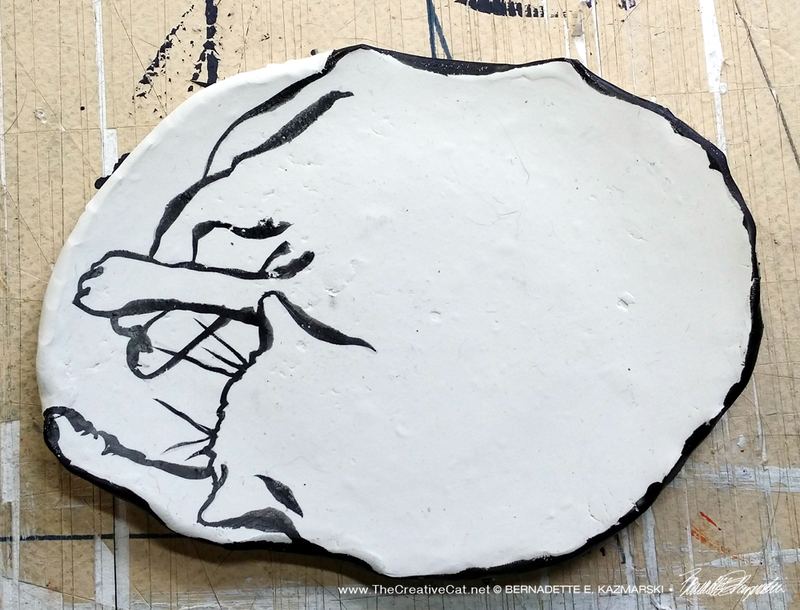 When I made “The Big Nap” I felt it was too large to be a trinket dish, though it might be used for one, and decided it might be more of a decorative item. So, I kind of make it up as I go along. 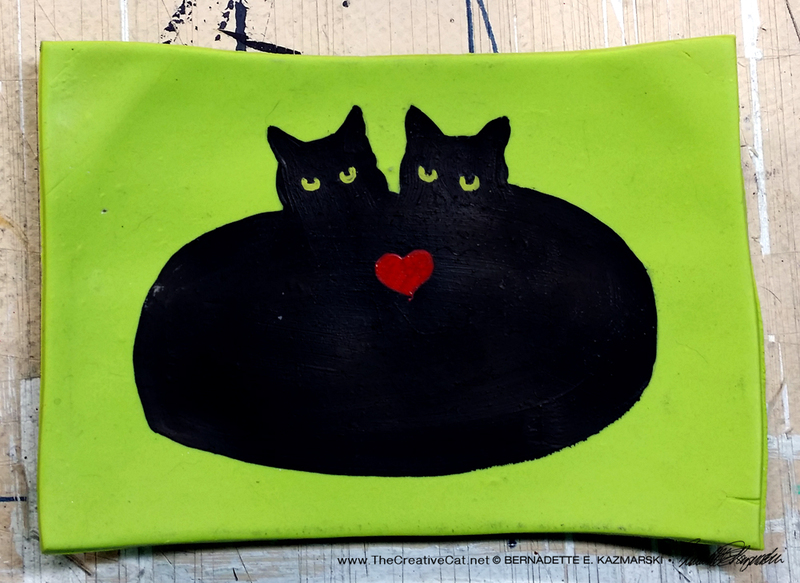 Maybe you want a set or it’s hard to choose just one, this special discount applies all the time on all designs of trinket dishes for $15.00, nature and cats: buy two trinket dishes for $25.00, use the discount code 2TRINKETS25. You get a $5.00 discount when you buy two. All tax, shipping and handling are included in that price. 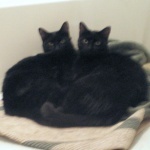 Buy one for yourself and one for a friend! 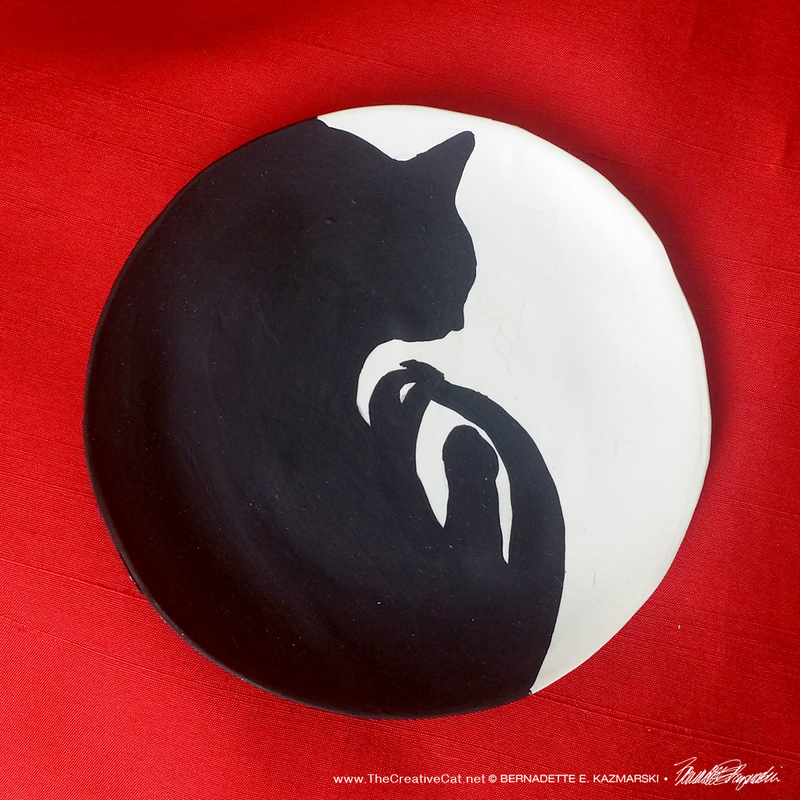 This 4” round curved dish is made from natural white polymer clay, handpainted with black design adapted from a daily sketch. NOTE: This dish is not safe for food or water. Curving Silhouette Trinket Dish angled view. 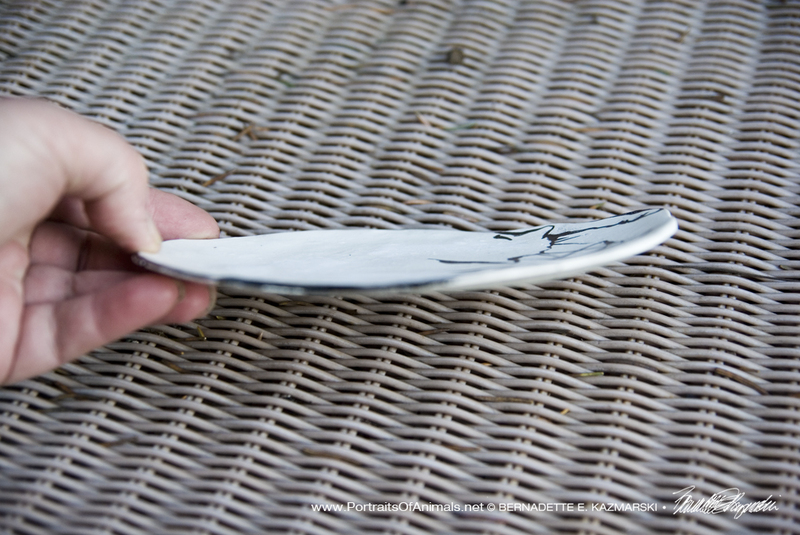 Curving Silhouette Trinket Dish edge view. Curving Silhouette Trinket Dish back. This may be my last experiment with polymer clay, though. With all the warnings about its toxicity and my felines’ keen interest in what I was doing, I think I’ll try air-dry clay next time, until the time I can start firing things. 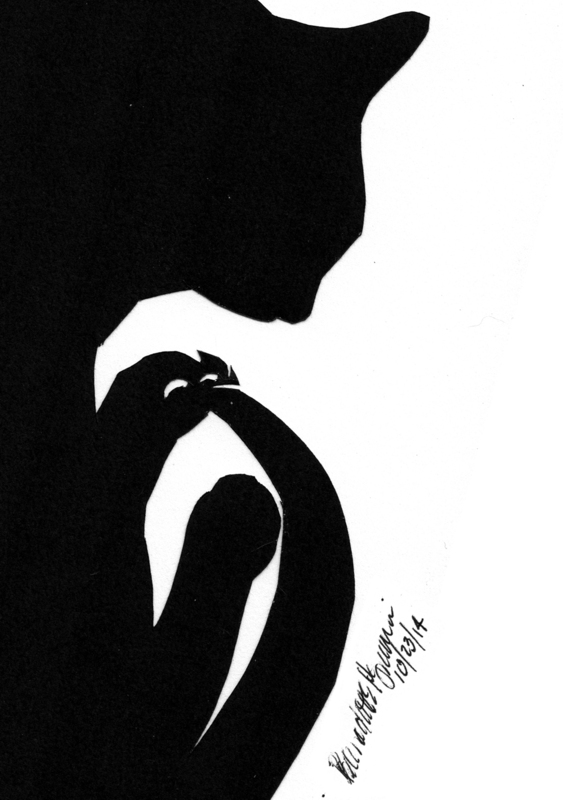 Read more about “Curving Silhouette” and my daily sketches on The Creative Cat. 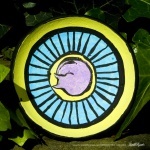 This 3.5” round curved dish is made from natural white polymer clay, handpainted with acrylic paints in a design adapted from a daily sketch, “World Cat”, and embellishment. Price includes shipping. 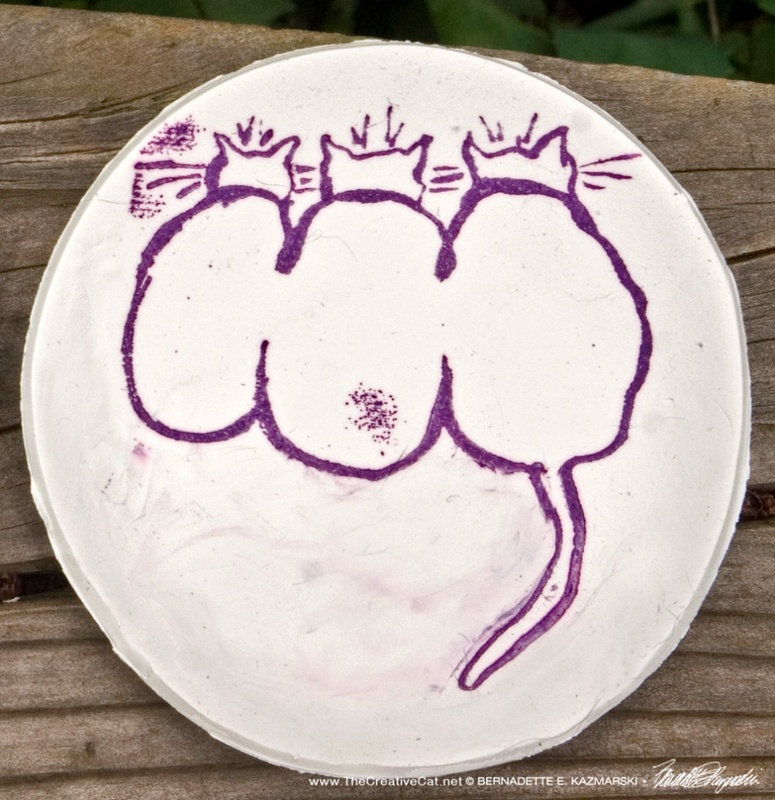 World Cat trinket dish, back. World Cat trinket dish, side. 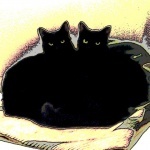 You can read more about the art and my daily sketches on The Creative Cat. This little trinket dish is 3.5″ in diameter and approximately 1/4″ deep, made from natural white polymer clay. Each dish is formed and painted individually. When I first made polymer clay trinket dishes last year they were kind of lumpy until I worked out how to make the shape for “Curving Silhouette”, but I kept those lumpy beginner dishes knowing I’d do something with them. 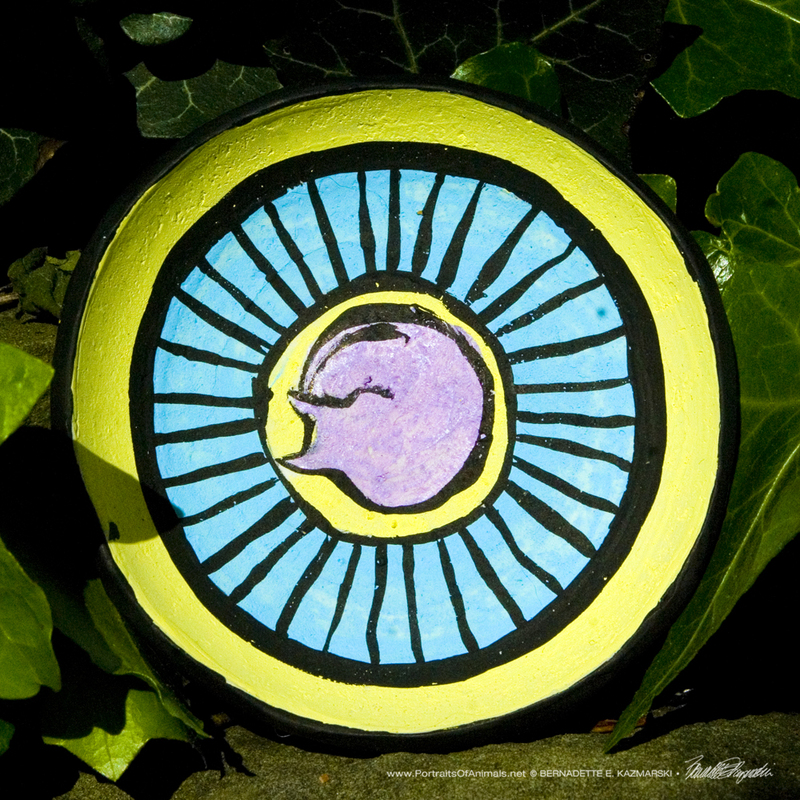 With one of the pet expos coming up I decided it was time to explore the idea of a little decorative painting on these, and especially those rays in a circle around the central figure. And those colors! This may be my last experiment with polymer clay, though. 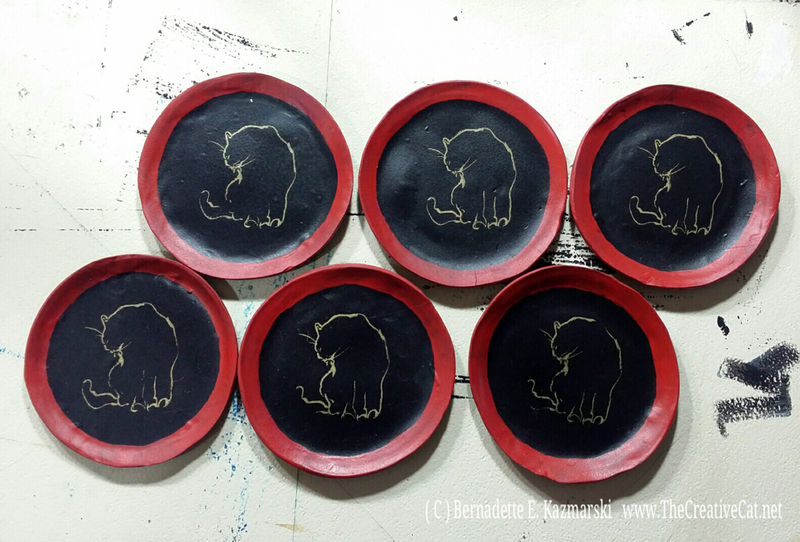 With all the warnings about its toxicity and my felines’ keen interest in what I was doing, I’ve been working with air-dry clay until the time I can start firing things. 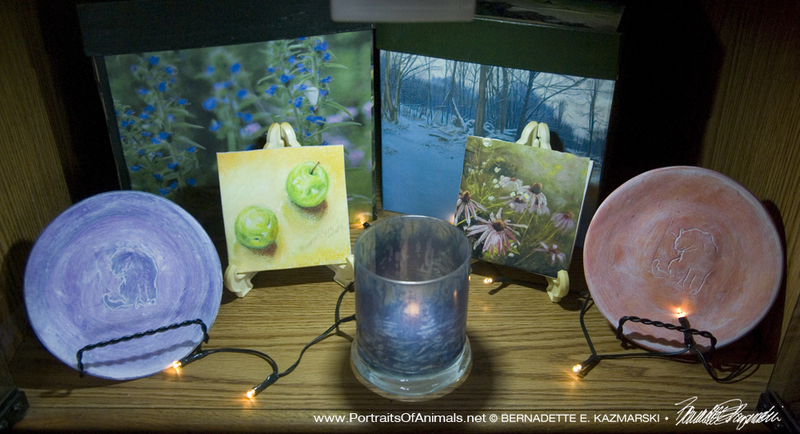 Find other trinket dishes in my Handmade Gifts Gallery or search “trinket dish”. 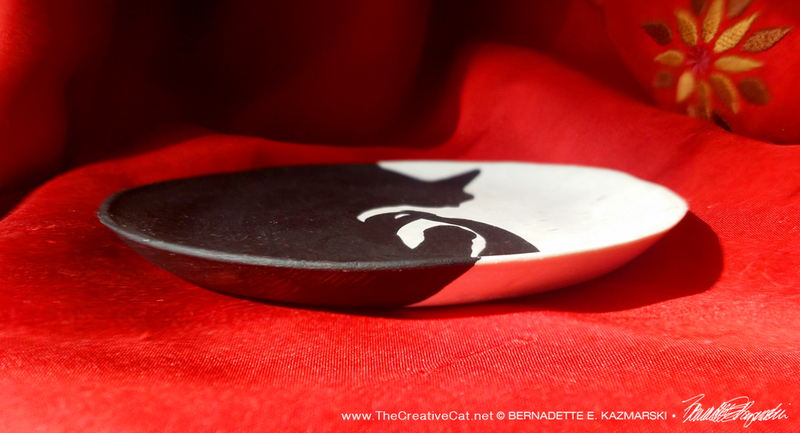 This 4” round curved dish is made from black polymer clay, trimmed in red and stamped in gold with my brush pen sketch “Bath”. NOTE: This dish is not safe for food or water. Japanese lacquerware was a popular theme in homes when I was growing up, and I always admired the deep black and rich red with gilded decoration and the glossy finish of the wooden salt and pepper shakers my mother had as decorations in the kitchen. A trinket dish in this style had been coming to mind for a while, and for the decorative image featured in gold in the center I decided to use one of my brush pen sketches. I had also long studied and practiced Japanese brush pen techniques, and brush pen illustrations were often used on red and black lacquerware items. 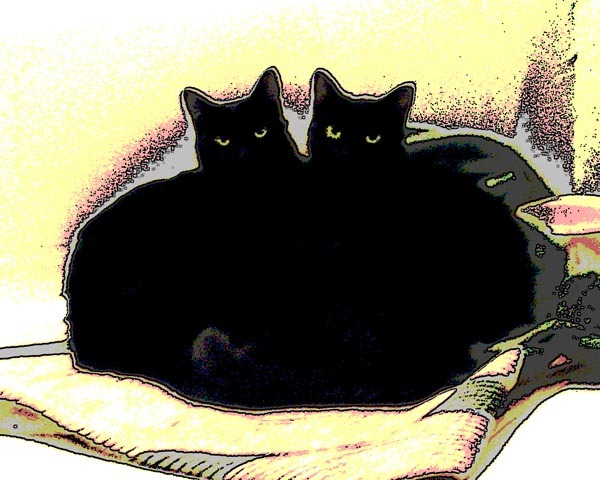 And, of course, brush pen sketches of cats are also a beloved theme in Japanese art, so it was a natural fit. “Bath” fit well in shape and style, and because I would have a stamp made from the sketch I wanted to be sure the simplicity of the lines would work on the stamp. Each dish is formed and painted individually. I rolled the clay fairly thin, cut it with a 4″ cookie cutter, and placed it in the bottom of an old cereal bowl and rolled a smaller bowl around the inside to thin the sides but leave the bottom a little thicker, then ran my finger around the edge to thin it out just a slight rounded edge. 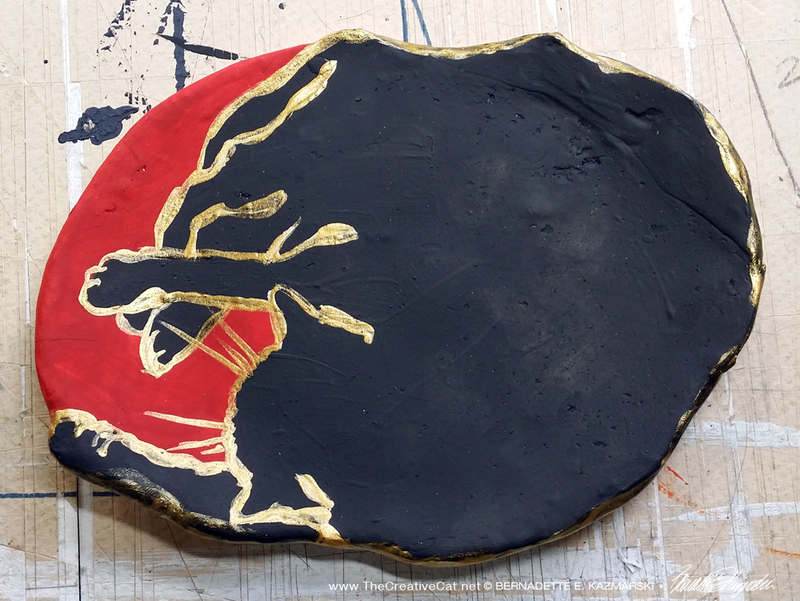 The design is painted in red soy-based acrylic paint and the sketch stamped in gold ink in the center. I gave it a light coat of polymer finish to protect the surface. Read more about Bath and my daily sketches on The Creative Cat. 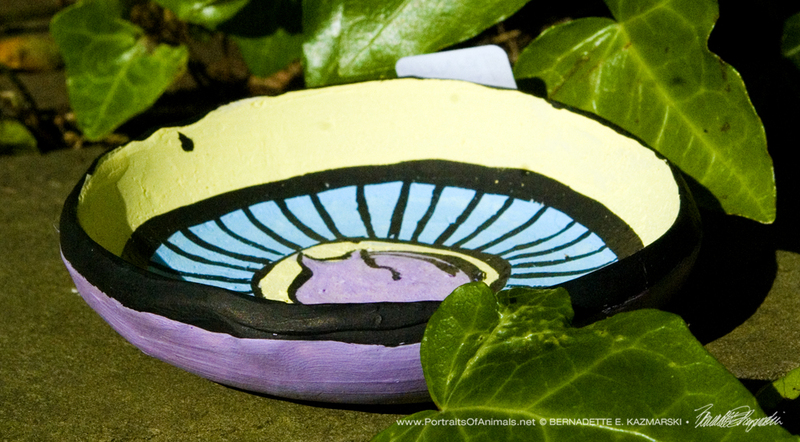 The Big Nap Decorative Dish is 6.5″ wide x 5″ high, and about 1/2″ deep, made of polymer clay. 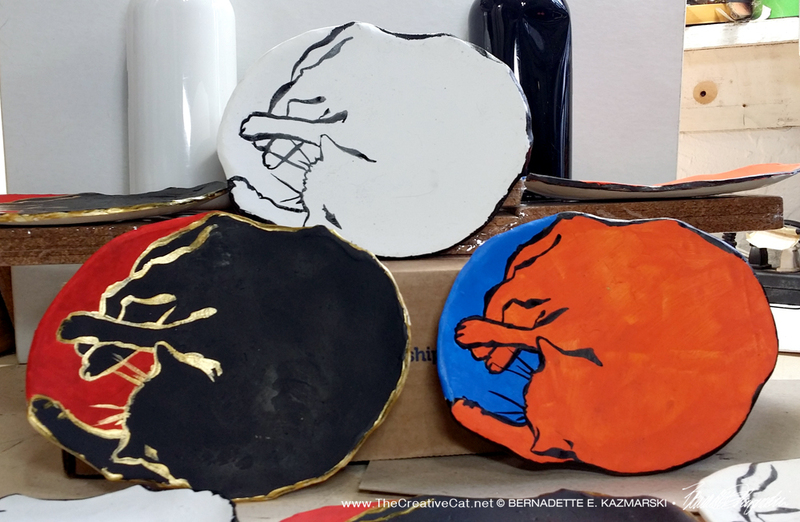 Each dish is formed by hand and individually painted with red orange and cobalt acrylic paint, and the original brush pen sketch is brushed on each dish. Each one is handmade, hand-painted and unique. NOTE: This dish is not safe for food or water. 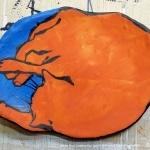 Orange and blue with black, “The Big Nap” decorative dish. 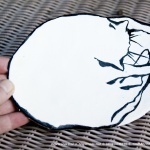 Original natural with black, “The Big Nap” decorative dish. Jelly Bean’s roundness is a little exaggerated but it really was a big nap. Another one of the feline shapes I love. 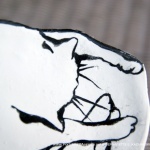 “Big Nap” decorative dishes are based on one of my brush pen sketches, each one handmade, hand painted and unique, reflecting my influences from Japanese brush pen art, Theophile Steinlen, and Andy Warhol. 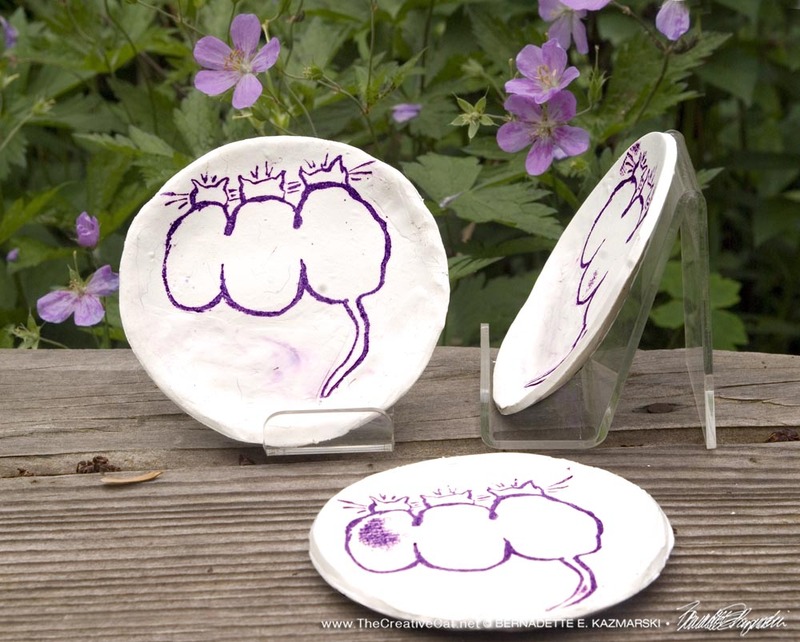 When I made my initial trinket dishes two years ago I developed a ton of ideas after working with both polymer and air-dry clay. The basis of one set of designs is my brush pen sketches integrated in several ways. I worked out the first of one of those styles, a little larger than the original 4″ trinket dishes, and using the outline of a sketch to shape the dish. Air-dry clay feels more like real clay but in earlier tests I found that worked this thin it would lose its strength, so I chose polymer clay. The round shape of “The Big Nap” fit well to this idea. I didn’t really want to cut around all Bean’s legs so I added a little to the shape to fill in around his legs. Because the clay is baked and it works best if the object is held to the final shape while baking the size ended up being determined by the one dish I could use to form the gentle curve I wanted that could also be baked in the oven along with the clay. After it’s baked, I use the same brush pen to draw the sketch onto the clay that I used for the original sketch. 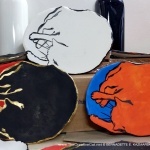 The orange and blue combination with the black outline is inspired by Andy Warhol. 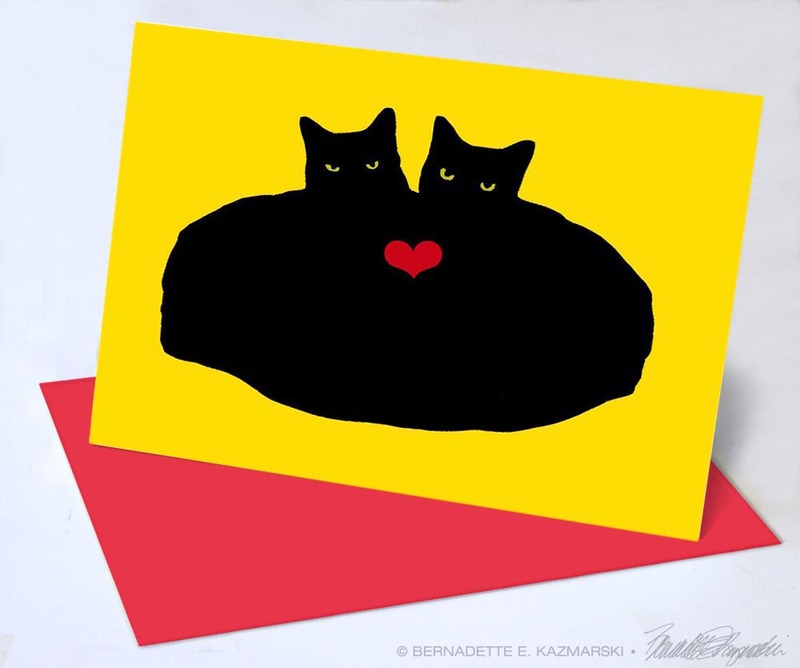 Years ago when I began filling my black ink and brush pen sketches with bright colors readers compared them to Warhol’s cats. Being from my hometown I had grown up with that as an influence and totally missed it. I’ll be making more of this style in a variety of other colors. Sometimes just a single interesting line is most expressive. 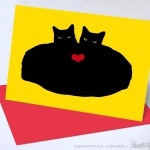 The red and black with gold is an homage to Theophile Steinlen’s style when illustration black cats with an accent color. He has been an inspiration since before I can remember, and while the black and white design was what inspired this particular dish, this design was the color version I envisioned before I knew I even wanted a color version. 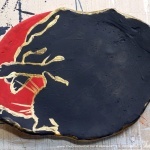 Black and red with gold, “The Big Nap” decorative dish. 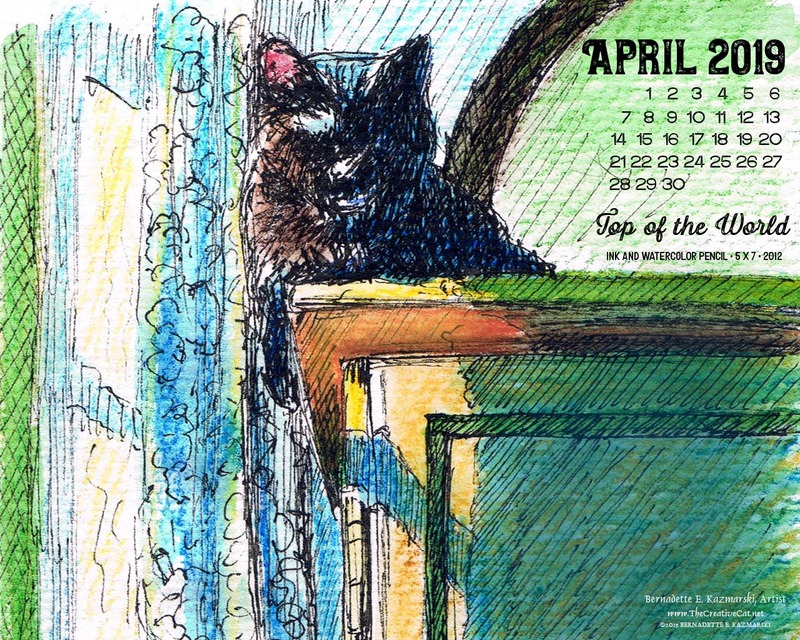 Read more about “The Big Nap” and my daily sketches on The Creative Cat. 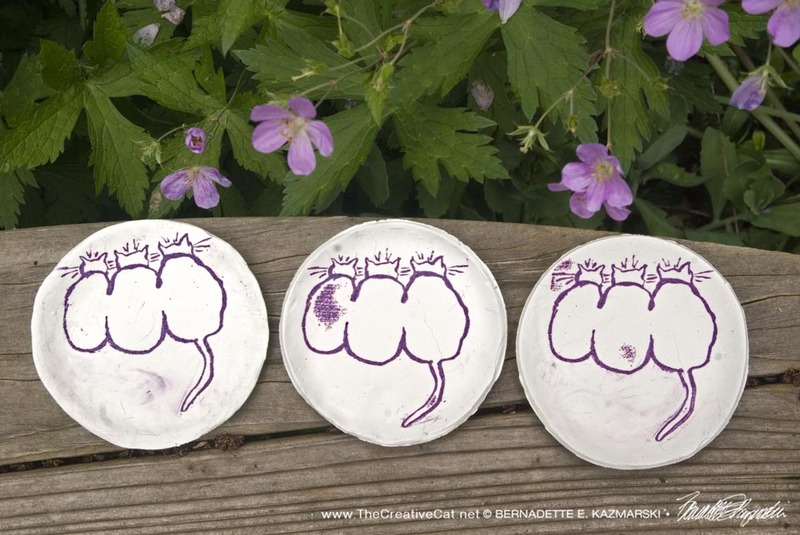 This 4” round curved dish is made from white polymer clay and stamped in royal purple with my brush pen sketch “Three Cats Looking”. NOTE: This dish is not safe for food or water. The dishes are 4″ white polymer clay but this time I’ve stamped “Three Cats Looking” in Royal Violet ink. I love this little brush pen sketch and I’ve always wanted to do something with it, so I had a stamp made and here is the first something. 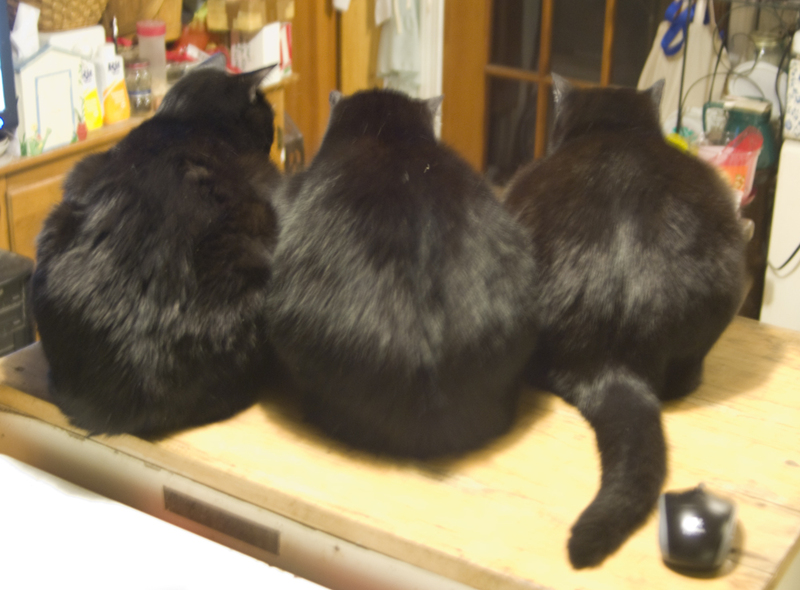 I wanted them to look as if they are looking over the edge of the dish so they are way at the top. I may paint one or two of these before Sunday, and some other ideas include a square or rectangular dish, and a flat coaster. I really, really want to do something with the tail to let it hang off an edge or something, but I’m just not sure the polymer clay will stand up to a beating with a tail that thin. 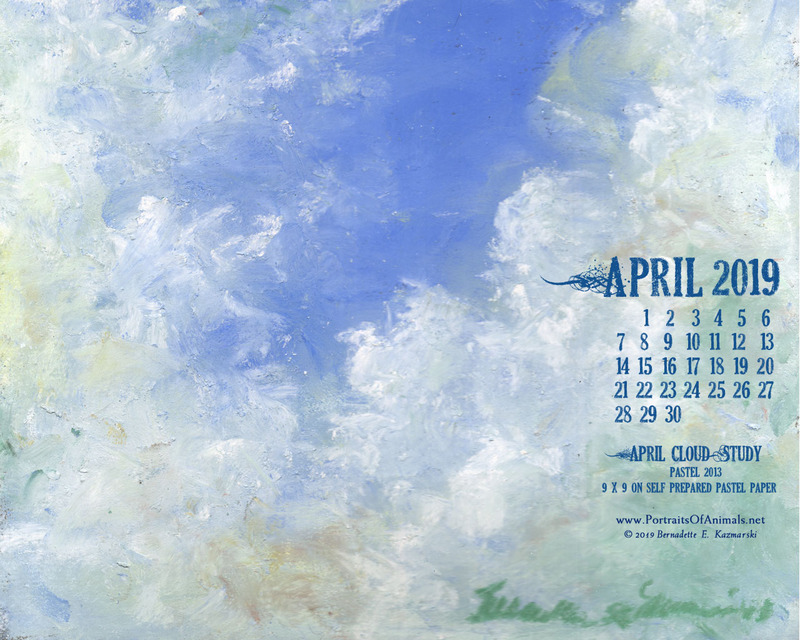 It’s always exciting to see a new design in its first use, and it really gets the creative juices flowing. I can’t wait to play around with these trinket dishes just a little bit this weekend and see what people think on Sunday, and get to other new things later! 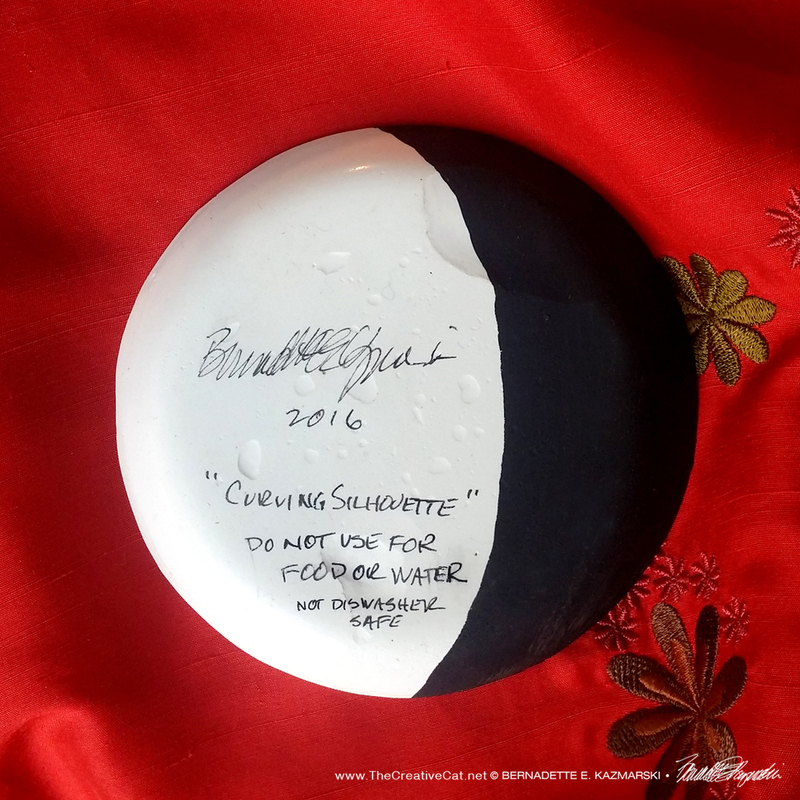 This 6” round shallow dish is made from white polymer clay stamped with my brush pen sketch “Bath”, then painted and given a wash of white. 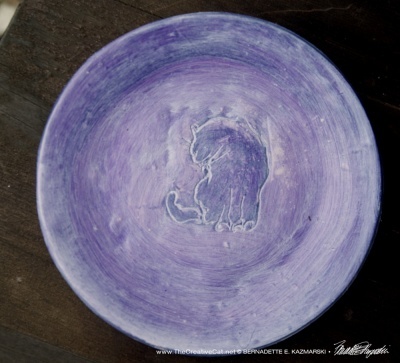 Bath 6″ Decorative Dish in Violet from the edge. Each dish is formed and painted individually. 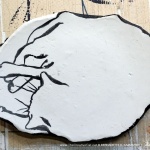 I roll the clay fairly thin, cut it with a 6″ cutter, and baked it on a curved plate. 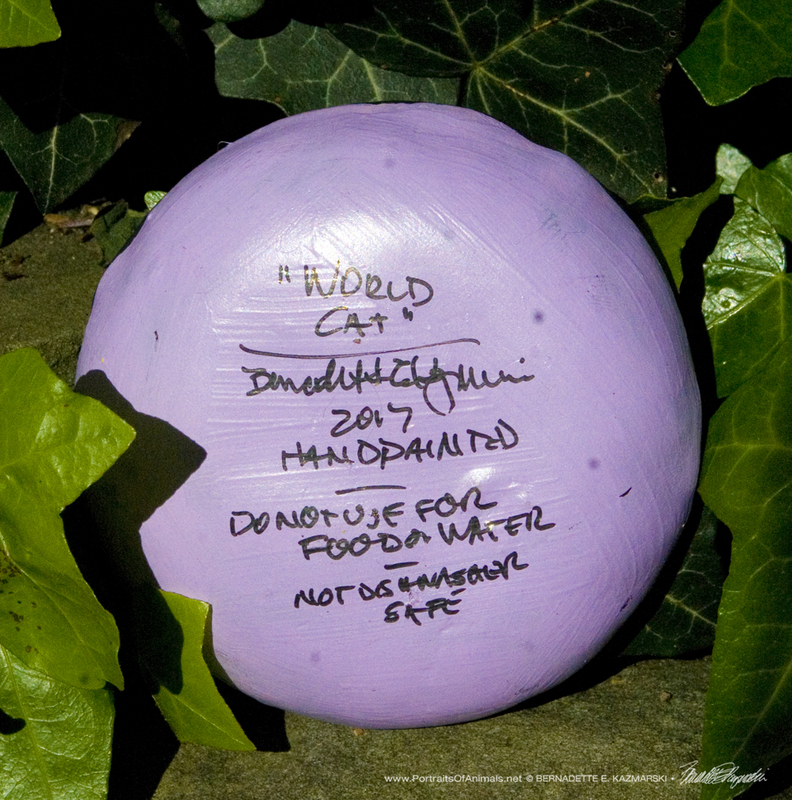 The plate is painted in violet acrylic paint, a little heavier on the kitty and around the edge, then given a wash of white to fill the impression from the stamp. Each dish is formed and painted individually. 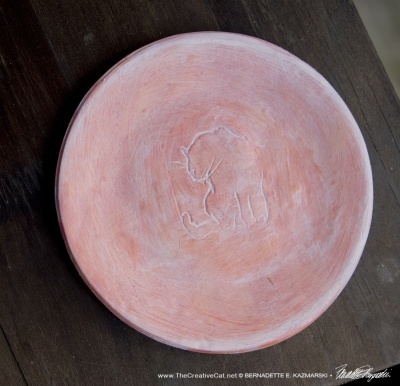 I roll the clay fairly thin, cut it with a 6″ cutter, and baked it on a curved plate. 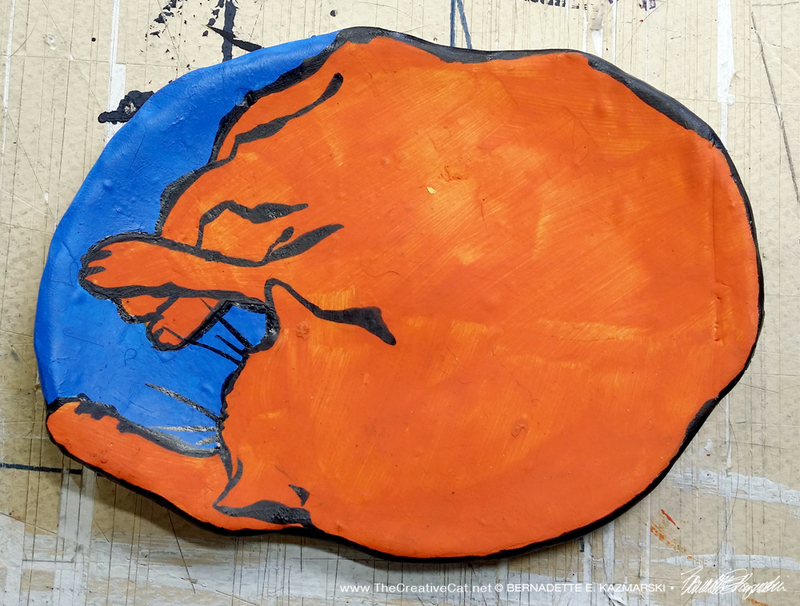 The plate is painted in orange acrylic paint, a little heavier on the kitty and around the edge, then given a wash of white to fill the impression from the stamp. 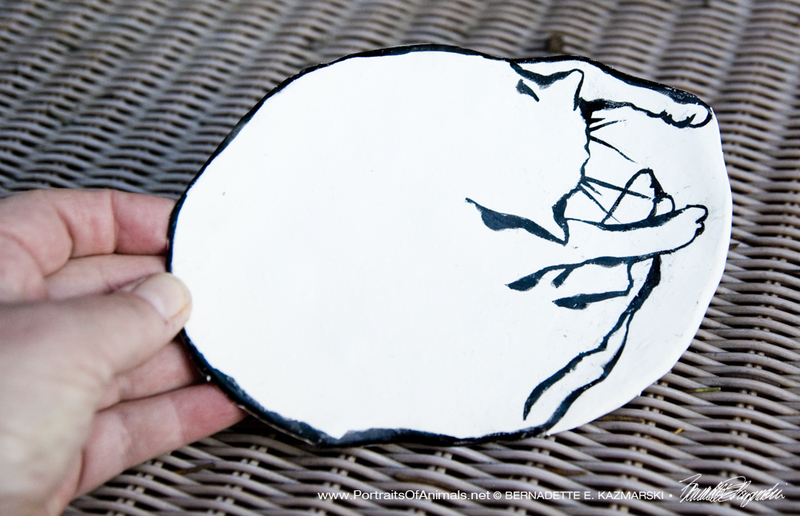 The Big Nap Decorative Dish is 6.5″ wide x 5″ high, and about 1/2″ deep, made of polymer clay and the original sketch brushed on each dish by hand. Each one is handmade, hand-painted and unique. NOTE: This dish is not safe for food or water. I am temporarily out of this style of dish, so the Add to Cart button below will not work until I am restocked and reset the button. 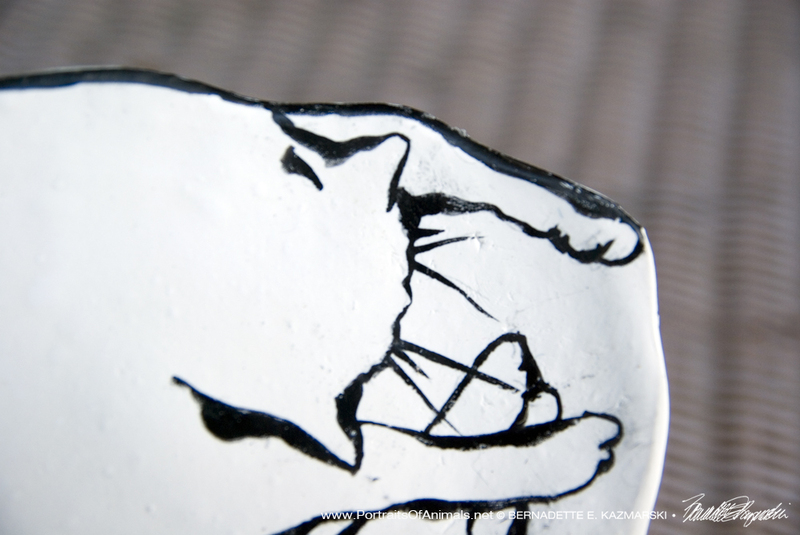 If you’d like to be notified when The Big Nap Decorative Dish, Japanese Brush Pen is back in stock, please send an email to bernadette (at) bernadette-k (dot) com. Thanks for your understanding! 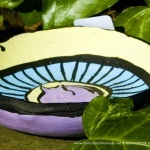 The Big Nap Decorative Dish is 6.5″ wide x 5″ high, and about 1/2″ deep, made of polymer clay. 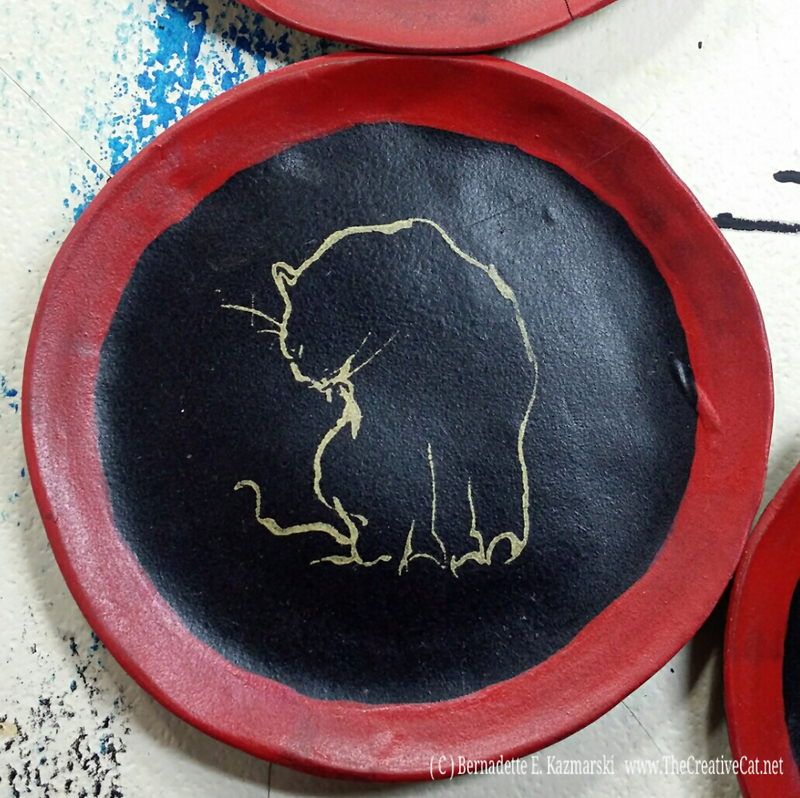 Each dish is formed by hand and individually painted with red and black acrylic paint, and the original brush pen sketch is brushed on each dish in gold. Each one is handmade, hand-painted and unique. NOTE: This dish is not safe for food or water.